Our in-house digital video team offers our authors and publishers the highest-quality state-of-the-art video presentations for the largest audiences. 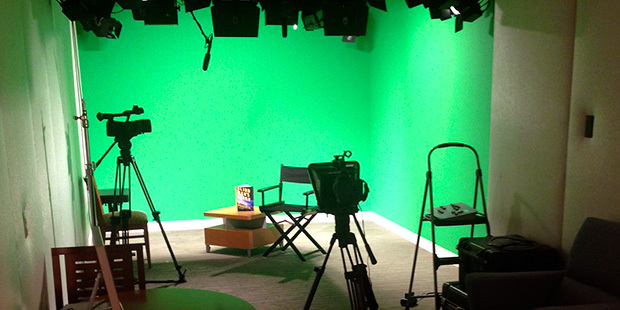 Now in our third year of operation, we continue to work with authors from all PRH divisions at our in-house studios, at major author events (BookCon, ComicCon, BookExpo, ALA), and on location for special projects. This year we are on target to work with more than 400 authors to make more than 600 videos, which will generate roughly 3 million views for PRH authors/titles. The work we do is broken into two major categories: title marketing/publicity and consumer content. For title marketing/publicity projects, we are essentially a service group for authors, marketers, and publicists looking to integrate video into specific title campaigns. Video in this category can take various forms: a message for PRH employees (for sales conference or pitch meetings), a short message for a specific audience (retailers, libraries, schools, social media), an advertisement (sometimes called a book trailer), or a live event (Facebook Live, etc.). These projects are generally initiated by author teams. After receiving an initial request, a video producer will work closely with the team to determine the right level of support. For simple projects, a shoot will usually consist of a thirty-minute session with one camera in one of our studios, while a more involved project could include writing a script, sketching a storyboard, and shooting for an entire day with multiple cameras. It all depends on the needs of the project. Dan & Phil Amazon 1080p from John Clinton on Vimeo. The consumer content category is a bit different. Rather than being integrated into a specific title campaign, videos we make in this bucket are part of the ongoing programming for Penguin Random House reader communities, with the goal of building direct long-term relationships with consumers. Unlike title campaign projects, where we are explicitly trying to drive awareness and sales, videos for reader communities are meant to be less like ads and more like original content, and the hope is that consumers will not only become subscribers to the community but also share videos with their friends. Papercuts is the video channel for the PRH reader community Read It Forward. Videos on this channel are meant for readers who love literary fiction and are looking for recommendations for their next great read. Signature Views is the video channel for the PRH reader community Signature. These videos are more topical, ranging from nonfiction authors sharing factoids from their books to fiction authors giving writing advice to behind-the-scenes looks at the publishing industry. Brightly Kids is the video channel for the PRH reader community Brightly, and specifically makes content for kids. Every month we post one “storytime” video, where our host, “Ms. Linda,” reads a picture book to the site’s online audience. Finally, the Penguin Random House video channel serves the general PRH reader community. We post one Author Shorts video per week, where PRH writers talk about life as an author, as well as videos recorded at major author events such as BookCon, ComicCon, etc. What kind of content will speak to that audience? Where should we be posting this video? What kind of promotional support can we muster up? What resources do we have at our disposal (talent, funds, time, etc.)? The answers to these questions inform everything from the type of video we make to the look and feel of the video’s thumbnail (the preview image that displays before clicking play). Ultimately, we need to make sure that as a company, we make the most efficient use of our time and resources when it comes to the tool of video, whether we’re trying to drive sales directly or contribute to the strategic goal of building our subscriber base. This is why a major priority for us in the coming year is to focus on video statistics, performance, and value. Tracking data like view counts, engagement rates, and video ad efficiency will allow us to improve PRH’s approach to digital video, as this form of media continues to be a major element of modern life. John Clinton is Senior Director, Digital Video for Penguin Random House.